Orbital ATK's uncrewed Cygnus cargo spacecraft sits atop a United Launch Alliance Atlas V rocket at Cape Canaveral Air Force Station in Florida on Dec. 5, 2015. That day's launch attempt was scrubbed by high winds; the next try will come Dec. 6. Bad weather foiled the launch attempt of Orbital ATK's Cygnus spacecraft Saturday (Dec. 5), delaying the cargo ship's return-to-flight mission for the third day in a row. 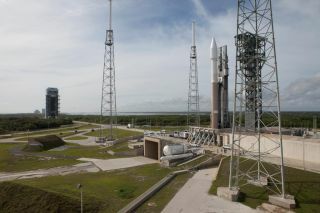 The unmanned Cygnus spaceship was slated to launch into space atop a United Launch Alliance (ULA) Atlas V rocket at 5:10 p.m. EST (2210 GMT) on Saturday from Florida's Cape Canaveral Air Force Station, but mission controllers scuttled the attempt several hours ahead of time because of concerns about strong winds. The next launch opportunity will come Sunday (Dec. 6) at 4:44 p.m. EST (2144 GMT). You can watch the launch attempt live at Space.com beginning at 3:30 p.m. EST (2030 GMT), courtesy of NASA TV. The launch was originally supposed to occur Thursday (Dec. 3), but the weather didn't cooperate that day. High winds forced another scrub on Friday (Dec. 4). Orbital ATK's Cygnus is hauling nearly 4 tons of supplies to the International Space Station as part of a $1.9 billion deal with NASA. About one-third of those supplies are science experiments. The liftoff will mark Orbital ATK's fourth cargo launch for NASA and the first Cygnus flight since October 2014, when one of the company's Antares rockets that normally carries the vehicles exploded just after liftoff, destroying its Cygnus payload. Orbital ATK plans to return its Antares rockets to flight in 2016. An illustration of Orbital ATK's enhanced Cygnus spacecraft on approach to the International Space Station. Orbital ATK is one of two commercial spaceflight companies with contracts to fly cargo to the International Space Station for NASA. The other is SpaceX, which has a $1.6 billion contract to fly at least 12 missions for NASA using the company's Dragon spacecraft and Falcon 9 rockets. SpaceX has flown six successful cargo flights so far, with a seventh mission failing in June. SpaceX plans to resume its NASA cargo flights in early January.